After a hard workout, strenuous hike, or overall stressful day, share a Copaiba massage with a loved one. Dilute Copaiba with V-6 Vegetable Oil Complex or a carrier oil of your choice and massage on fatigued areas after activity for a comforting cooldown. Copaiba has a soothing, complex flavor with a hint of balsamic. Its high beta-caryophyllene content makes it a popular dietary supplement. Young Living’s Copaiba Vitality is labeled for internal use and makes a great addition to herbal teas such as chamomile or rooibos. It can also be added to a capsule and taken internally. 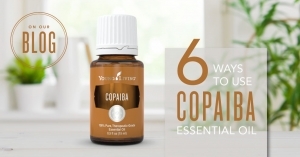 What is your favorite way to use Copaiba essential oil?